Get fit for a great cause! Join us at Ogden Park on Saturday, April 13 from 9am-12pm for a morning of fun and fitness! 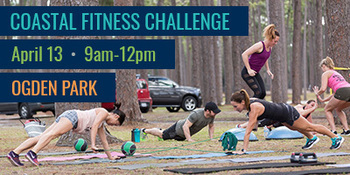 The Coastal Fitness Challenge will feature 50-minute group exercise classes taught by instructors from local fitness programs including FIT4MOM, Axis Fitness, Burn Boot Camp, TF Fitness + Nutrition, and Echo Farms Park. Classes are just $15/each and all of the proceeds benefit New Hanover County’s parks. Space is limited, so get your tickets today! Visit NHCParksConservancy.org to view the class schedule and to purchase tickets. April is here and it is officially Splashpad Season! The splashpad at Hugh MacRae Park is open daily 9am-sunset through October. The splashpad has a water wheelchair available for use by children whose mobility devices cannot tolerate moisture. Contact the parks office at (910) 798-7620 to arrange for wheelchair use. Visit Parks.NHCgov.com to learn more about the splashpad and get some tips on how to keep the splashpad and our kids safe and healthy this season. *Airlie Gardens will be closed to the public on Friday, April 5th for a private event. *The Arboretum will only be open to Garden Tour ticket holders April 5-7th. *New Hanover County Residents Free Day at Airlie will be April 14th. gardener volunteers for advice on planting and long-term care. This event is free and open to the public 9am-5pm on the 11th through the 13th, and 12-4pm. on the 14th. For more information, click here. The Arboretum grounds will be closed to the public from April 8-10th to prepare for this event. Friends of the Arboretum can get a first look at the plant selection on April 10th from 12-4 pm. The tennis courts at Echo Farms Park will be closed April 1-3rd for irrigation improvements. Repairs to the Ogden Skatepark are scheduled for Friday, April 19th. Check out the online calendar for the Tram Schedule or call (910) 798-7700. Airlie Gardens will be closed on Friday, April 5th for a private event. New Hanover County Parks & Gardens strives to maintain and operate parks and facilities that enrich the lives of the community and promote an overall healthier lifestyle.